Book review: "Your Guide to the 2017 Total Solar Eclipse"
The book begins on the topic of “What’s All the Fuss About?”. He clearly covers the basics of the different types of eclipses and leads the reader to the punchline of “It’s all about totality”. He makes the case that this is the peak celestial sight that anyone can and should try to experience. Michael describes the fascinating history of past eclipses from early civilizations to the present day. He shares many images and quotes from his extensive collection of eclipse books and ephemera. I appreciated the extensive quotes from the 19th century eclipse enthusiast Mabel Loomis Todd, a gifted writer on the majesty of the total eclipse of the Sun. There is proper attention to the importance of safely viewing the partial phases of a solar eclipse and Michael successfully walks the tightrope of giving sound advice on safe viewing of the partial phases of eclipse along with the guidance of when and how to view the glory of the Sun’s corona during totality. The book includes a surprisingly comprehensive section on the selection of suitable binoculars and telescopes that is applicable to all types of astronomy as well as eclipses. For those who choose to photograph the eclipse - and Michael gives the correct guidance for most first timers to simply watch the eclipse - he gives practical instructions to get amazing photographs of the eclipse. An ingenious chapter describes a number of projection viewers and simple science experiments that can be done during the eclipse. I especially enjoyed the camera caddy project and may build one myself for managing my multiple cameras. The reader also learns about the phenomena of the eclipse and tips for watching sights such as the rushing umbra, shadow bands, and the diamond ring. An excellent chapter on community organizing in the book is written by Kate Russo. Communities in the path of the 2017 eclipse are in the dark about what to expect and Kate gives her expertise gained from several prior eclipses as well as her professional background in psychology. The book concludes with a narrative on the importance of weather awareness and a selection of great spots to view the eclipse. I found the illustrations in the book to be first rate. They are very clear and well rendered by Roen Kelly and Holley Bakich and match the quality of illustrations in Astronomy Magazine. My only minor criticism is that I would have liked to have seen more detail in the eclipse maps, but I’m naturally biased towards a map-centric presentation. Michael is also applying his expertise to what just might be the largest single astronomical gathering in history at an airport in St. Joseph, Missouri. See http://stjosepheclipse.com/ for details. This book by engages the reader with clear and reliable explanations leavened with a dash of humor. Highly recommended for first-time eclipse observers! Last month I attended and presented at the National Science Teachers Association (NSTA) national conference in Nashville, which just happens to be the largest city within the path of next year’s totality. I was excited at this educational trifecta opportunity: a chance to visit “Music City,” and take in all the entertainment, food and history that Nashville offers; to present at a national teaching event and talk with science teachers who will witness a total eclipse; and to visit Nashville’s Adventure Science Center and Vanderbilt University’s observatory. My first day at the conference started optimistically but ended frustratingly: armed with solar glasses and information to distribute to my peers, I chose to attend workshops that focused on: a) science literacy techniques, b) using social media to promote science, or c) learning how to submit scientific articles for publication. All were good workshops, and I made some useful contacts, but when approaching teachers afterward to discuss TSE2017 with them, I got many blank looks and replies of “I had no idea there was an eclipse coming to this area.” At that point, I knew I’d have to get into serious outreach mode over the next several days in order to generate significant awareness among my colleagues. By the end of Day 1, I resigned myself to the fact that virtually all the science teachers made contact with that day were not aware of the eclipse, and—worse yet—some didn’t even seem to care. It’s one thing to talk to the general public and get mixed reactions and uninterested replies, but when it comes from one’s own peers, that was difficult for me to accept. My thought was, “if they don’t know (or care), how will their students?” Obviously, some work needed to be done on Day 2. Packing more solar glasses, my Coronado solar scope, GreatAmericanEclipse.com stickers and a short video on my phone, I set up shop in the large common areas of the Music City Center, a vast space with over 10,000 teachers on hand. That seemed to work well, thanks to free handouts and a sunny day, where many teachers took a few seconds to directly and safely observe the Sun with both scope and glasses. As with students, nothing gets more reaction and interest than a hands-on lesson! Feeling much better about things, I visited the vendors area and stopped by to say hello to the Celestron folks, where I traded my freebies for a door prize ticket. And what a door prize I won—a brand new Evolution 6 telescope and tripod! I promised them right there that it would accompany me on all my outreach trips over the coming months (I kept my promise—it saw first light this week at a local event with students observing the Sun through the scope and learning about eclipses). By the time of my presentation Saturday morning, things were definitely looking up, and by the time my workshop ended, my classroom of teachers accompanied me outdoors to view the Sun, at which point many more passers-by joined us. Not one pair of glasses was left, cards were exchanged, and many more teachers now know what to expect next summer, and how to prepare themselves and their students for TSE2017. My last day in Nashville was spent at the Adventure Science Center and its Sudekum Planetarium, where I was invited to take part in an afternoon sky-show. I distributed the last of my solar glasses to the visitors (again, as with the NSTA teachers, there was virtually zero eclipse awareness among the public as well). After that, I stopped by Vanderbilt’s Dyer Observatory, atop a hill overlooking the city. The director, Rocky Alvers, and his staff were wonderful and thorough hosts, showing me the many instruments and artifacts (some from the 19th Century and earlier) on view. One fascinating stop was the “camera obscura” cave, where sunlight let in from a small hole atop the earthen dome focused a 360-degree inverted image of the surroundings onto the darkened walls of the cave. The good news from this visit: The Dyer is very much on top of the eclipse and will be doing solid outreach over the coming year. As I was flying home, I realized the point of this experience: don’t let an initial feeling of frustration or disappointment get in the way of instruction and outreach. If I had let my feelings from Day 1 persist, not nearly as many teachers would be aware now, so don’t ever give up! A magnificent Indonesian total solar eclipse! We enjoyed a spectacular total solar eclipse in the Makassar Strait between Borneo and Sulawesi this past March 9th. It was the last total solar eclipse before the coming eclipse over America on August 21, 2017. This eclipse passed over the Indonesian islands of Sumatra, Borneo, Sulawesi, Ternate, Tidore, Halmahera, and other smaller islands. The eclipse also passed over several atolls of Micronesia before sweeping over much of the Pacific Ocean. Eclipse tourists were mainly concentrated on the islands of Bangka, Belitung, Sulawesi, Ternate, Tidore, Halmahera, and smaller islands in their vicinity. Several ships were also positioned for the eclipse, the largest of which was the Holland America Volendam. Eclipse weather results were mixed. Indonesia has high humidity and considerable tropical cloudiness; the western half of Indonesia has a generally wetter climate than the eastern half. But the outcome on eclipse day was somewhat the reverse; most groups in the west enjoyed clear or partly clear skies and those in the eastern islands around Halmahera suffered under significant clouds and those who did see the eclipse saw it only through thin clouds. This outcome was reminiscent of the November 2013 eclipse in Africa when again the outcome defied the climatological expectations. Enjoy these maps, videos, and images from eclipse day. This was the 8th total solar eclipse for Michael and the 4th total solar eclipse for Polly. The two videos below capture the excitement as viewed by Mike Kentrianakis from an Alaska Airlines flight from Alaska to Hawaii which was diverted to intercept the eclipse and videographer Nelson Quan's proposal to his bride-to-be during the eclipse. You can't help but get excited when you fly with us and see a solar eclipse. We adjusted Flight #870 from Anchorage to Honolulu on March 8, 2016 just so our passengers could catch the solar eclipse from 35,000 feet. Marriage proposal of award winning director, Nelson Quan, under the total solar eclipse of 2016 in North Mamuju, Indonesia. The eclipse early in the morning in the Makassar Strait. Polly took a quick set of photos with her iPhone which have been stitched together to give an impression of the sky's appearance during the eclipse. These are scenes from eclipse day, March 9 2016, on board the Holland America Volendam in the Makassar Strait. Over 1200 passengers enjoyed a splendid view of the Sun's corona as well as many of the ship's crew. One of the real pleasures of eclipse travel is the opportunity to see exotic and interesting places on our beautiful planet. These are scenes from Singapore and Indonesia. More scenes from our trip including Borobodur, Bali, and Singapore. Update on September 13: Many in South Africa and at least two expeditions from elsewhere successfully saw the partial solar eclipse. These are several photos taken by Professor Pasachoff at L'Agulhas, the southernmost tip of Africa and the point of maximum eclipse in Africa. Click on any photo to see higher resolution. The partial solar eclipse of September 13, 2015 is visible from southern Africa and Antarctica and is followed two weeks later by a total lunar eclipse. A partial solar eclipse occurs when the alignment of the centers of the Sun and Moon just misses the Earth surface but the Moon's outer shadow, the penumbra, does reach the Earth. At the point of greatest eclipse in Antarctica, about 78% of the Sun's diameter will be occulted by the Moon. The maximum partial solar eclipse in South Africa is 44%. Click on either map to view an enlargement of that map. As with any solar eclipse, you must use either approved eclipse glasses or a projection method to safely view the eclipse. This will be the last partial solar eclipse before the August 21, 2017 total solar eclipse which crosses the United States. Before the 2017 Great American Eclipse, there will also be a total solar eclipse over Indonesia on March 8, 2016 and an annular solar eclipse over Africa on September 1, 2016. As a science teacher, it continually frustrates me to see what teaching and learning has evolved to in the US. Current educational lingo comprises terms like "Common Core," "Next Generation Science Standards," and "Flipped Classroom," and although I have been teaching to these goals for the past several years, I'm still not quite sure about where this is all going. Do we really need 27 different ways (no lie!) to teach ratios? Are shortcuts to deriving an answer really bad? Does every math answer need to be in the form of an extended ELA response? Is "6 r2" more descriptive than writing "6 1/3"? Has the learning pendulum finally swung too far? "Every year it gets worse" is what I and other teachers say, and very few will argue that point. Students seem more distracted, teachers more frustrated, administrators more cow-towing, and parents angrier at the whole system than ever before. In 1957 the world celebrated the International Geophysical Year (IGY), the goal being a renewed understanding of, and interest in the natural world. This coincided with the launch of Sputnik and the formation of NASA one year later. It was the age of atomic submarines and passenger jets, of microwaves and videophones. We were watching the Jetsons. In the short dozen years from 1957 to 1969, we went from small boosters exploding on launch pads to the behemoth Saturn V taking Armstrong and Aldrin to their first steps on the Moon. And during this time many products were invented that we now can't imagine living without. And at the foundation of this greatest decade of achievement was what the astronauts called "Go Fever"--the belief that no goal was too unreachable, no idea too far-fetched. The self-fulfilling prophesy kicked in. As a child and student in elementary school, I felt this national confidence as well, when our teachers would take us from class into the auditorium or cafeteria to watch a liftoff or splashdown, or when my mother let me stay home from school to watch an Apollo EVA on TV. Or when we were actually shown by our scoutmaster how to make an eclipse viewer so we could watch the 1970 eclipse outdoors and not on television. All of those events were touchstones for me, and remain the main reasons I fell in love with the natural sciences, especially astronomy. How many students can say this today? Are there any similar events now that inspire our young learners to achieve great things? Is there an Apollo moonwalk for this generation? An IGY? I say yes, there is: The Great American Eclipse of 2017. I have every hope that it will do for today's students what those awe-inspiring events did for me many years ago. And now the challenge for me as an educator is to make sure that happens. The total solar solar eclipse was the first of a series of eclipses which visited the European continent in 1715, 1724, 1737, 1748, and 1764. 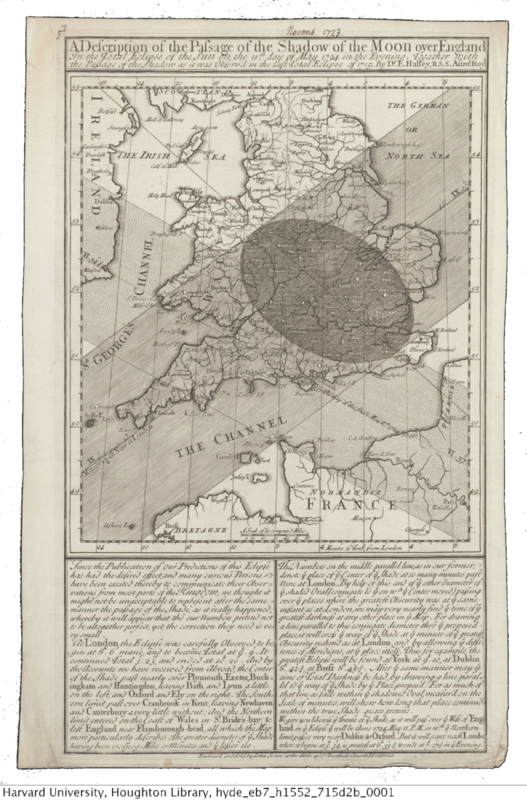 The pivotal eclipse broadsides of Edmund Halley for the eclipses of 1715 and 1724 are probably the most famous early eclipse maps because they were widely available to the English public and prepared many people to successfully observe the eclipse of 1715. In this period in Britain, a broadside was a sheet printed and sold on the streets on a subject of topical or scientific interest. Although many broadsides of Halley’s map were printed, few survive today and command high prices at auction. Besides the new level of accuracy in eclipse predictions, there are two interesting innovations in Halley’s 1715 eclipse map. The first innovation is the umbral oval within the map that gives the map reader a picture of the umbra as a shadow intersecting the earth at a moment in time. From this oval, the map reader understands that the shadow is sweeping along the path of totality. The oval is an interesting map feature that combines the geographic context with the temporal dimension of the eclipse and gives the map a sense of dynamism. The other innovation is Halley’s invitation for eclipse observations, shown in the text at bottom. Halley did receive reports from many parts of southern England which he applied to create a revised map with improved eclipse lines. This is akin to today’s social networking technology and makes this map participatory instead of a one-way broadcast of information. Owen Gingerich wrote an article “Eighteen-Century Eclipse Paths” in Sky & Telescope magazine, 1981, volume 62, page 324-327. This article discusses how Halley used observations after the eclipse to produce a revised and more accurate second edition several months later. Eclipse chasers frequently have a "trip of a lifetime" every 18 months or so. That's because we seek out nature's most astonishing spectacle and our journeys usually take us to remarkable and exotic locations. All of these eclipse-chasing trips are filled with adventure, culture, and grandeur. After all, what a cosmic coincidence it is that the Moon can perfectly occult the Sun to reveal the most beautiful object in the sky, the Sun's corona. Once a total solar eclipse is first seen, eclipse chasers are smitten and go to great distances to catch another view of totality. But I can truly say that my recent expedition to Svalbard was indeed a trip of a lifetime. We enjoyed a spectacular confluence of natural wonders and the great luck of perfectly sunny skies on eclipse day. The eclipse also drew us to the spectacular scenery of the high Arctic archipelago of Svalbard. At 78 degrees North, we were halfway from the Arctic Circle to the North Pole and above nearly all the land mass of North America and Russia. I was privileged to again join the Williams College solar eclipse expedition organized by Professor Jay Pasachoff. Funding for the expedition came from Williams College and the National Geographic Socieity. Our last eclipse excursion was in November 2013 to the equatorial African nation of Gabon and we met with great success there. The members of our party captured photography, video recording, and spectral measurements to continue scientific records of the Sun's activity throughout the 11-year solar cycle. Professor Pasachoff and his student, Allison Carter, captured high resolution images of the corona. Aris Vougaris, John Seiradakis, and Ron Dantowitz deployed sensitive spectrometers to document the relative abundances of highly ionized iron as a proxy for coronal temperature. Mike Kentrianakis captured a video record of the eclipse. My main contribution to the expedition was to precisely identify which locations in the vicinity of Longyearbyen were suitable for eclipse observation. We faced two challenges in Svalbard: the Sun at eclipse was only 11 degrees above the horizon and we were in a mountainous terrain. I developed maps such as the one to the left to guide our site selection in the Adventdalen, the valley to the east of Longyearbyen. Our adventure began on our flight from the United States to Oslo, Norway. We had the amazing good luck of the strongest geomagnetic storm of the current 11-year solar cycle that evening. Through most of the flight, my travel partner, Mike Kentrianakis, and I were transfixed by the spectacle of bright and dancing auroral curtains and streaks through our jetliner windows. This show lasted for several hours and we couldn't sleep. The adrenalin of this celestial sight kept us going and we knew we had seen something truly remarkable. I took these photographs with my Nikon D750 with zoom lens set to 28 mm. I set the camera to automatic, pushed the ISO settings to maximum and maximized the additional stop settings. To my surprise, the aurora was so bright that I was able to capture these photographs with hand-held exposures. We arrived in Longyearbyen, the northernmost city in the world with about 2000 inhabitants. The bracing cold of the air plus the white scenery declared that we had entered the realm of the Arctic. After disembarking the aircraft, we were greeted by a stuffed polar bear in the airport terminal, reminding us that in this special habitat we do not occupy the top rung of the food chain. Longyearbyen is the major settlement in Svalbard and a few other research and mining stations dot the archipelago. The hotels, restaurants, and other businesses were quite good considering the extreme environment. Because we were there during the Spring Equinox, day and night had similar lengths but the Sun never reached more then 11 degrees high in the sky. Snowmobiles are as numerous as cars and dog sleds are another option to explore the backcountry. An ever present sight were rifles for rare but always present possibility of encounter with a polar bear. This settlement began as a mining operation exploiting the high-quality coal found here and currently the economy is transitioning to tourism and arctic research. Eclipse day began with overcast clouds at sunrise that quickly dissipated. Weather is always the dominant concern of eclipse chasers, but we knew early on that we were in for a special treat. We situated ourselves on a broad ice field where we could enjoy the entire eclipse from begin to end. From the moment the Moon first occulted the Sun to the end of eclipse was two hours. Of that duration, the total phase of the eclipse lasted 2 minutes and 27 seconds. Of special note were the obvious shadow bands dancing on the icy field in front of us. These photographs were taken with a wide-angle fisheye lens on a Nikon D300. In these photographs, you can see the Moon's shadow sweeping in the sky from right to left. On the morning of April 4th, a special opportunity exists for astrophotographers to capture the ISS transiting the Moon during the lunar eclipse. This will be a photogenic opportunity for persons with telescopes mounted with a video camera. In a message on March 29 to the Solar Eclipse Mailing List (SEML), John Irwin from the UK writes: “I spy another opportunity to catch the ISS transiting an eclipse, this time across the Moon during the lunar eclipse next Saturday, 4th April (UTC). There is no possibility of a transit while the Moon is totally eclipsed because the ISS is on the lit side of the Earth at that time (totality lasts only ~5 minutes anyway). But there's a favourable pass on the other side of the Earth between 51 minutes and 25 minutes before totality during which the Moon will be in deep partial eclipse.” These maps show the path of the transit using computations by John. Click on any map to see an enlargement. Scroll down to read more on how to read these maps. "I've updated the path coordinates for the ISS lunar transit based on new predicted orbital elements for Saturday. These new elements include the ISS orbit raising manoeuvre yesterday, the effect of which has pushed the transit path back to nearly its original position and time indicated in my previous set of predictions. Coordinates are given at 1-second intervals along the whole of the central path for which both the northern and southern limit exist. They are accompanied by the transit duration (seconds), path width (kilometres), azimuth and altitude of the Moon/ISS (degrees), and the angular diameter of the ISS (arcseconds). In general I would recommend heading for the central line to maximise duration. If that is not possible, then try to keep to the south of the line to allow for your height above mean sea level. It would be a good idea also to keep well away from the path limits because the path may drift enough between now and the time of the transit to put you outside the path. Finally, it is anticipated that there will be some drift along the central path too, amounting to several seconds (possibly more), so you will need to take this into account when planning your observations. As the transit path passes over a lot of high-altitude terrain, you may wish to make a correction to the position of the central path to allow for your local geodetic height. The approximate formula d=h*cot(A) can be used, where d is the path displacement, h is your height, and A is the altitude of the Moon, available from the path table. The direction of the displacement is given by the azimuth of the Moon, also given in the table. Note that this formula doesn't work well for very low lunar altitudes. As an example, take the situation at Reno, Nevada where h = 1373 m. The transit here is predicted to take place at 11:28:22 UTC at which time A = 23.9 degrees. Then the central path will be displaced by d = 3.1 km at an azimuth of 239.3 degrees (reckoned from north through east). This is roughly 2 miles WSW." The next several weeks will be exciting ones for me, as I’ll be stopping at Charleston, S.C., Greenbelt, Md., and Chicago, all with the goal of generating increased awareness of 2017’s Total Solar Eclipse. In each case, I’ll be talking with very different groups: in Charleston, the Visitors and Convention Bureau; in Greenbelt, NASA Education; and in Chicago, the National Science Teachers’ Assoc.’s national conference and students, teachers and administrators at two high schools. Tuesday’s meeting with NASA/Greenbelt will be a different story--I’ll be meeting with staffers already aware and preparing for the big event in 2-1/2 year’s time, devising strategies to better prepare school districts and municipalities on not only how to safely observe the eclipse, but to make certain students and the general public are not scared into remaining indoors, reduced to watching the beautiful spectacle of a total solar eclipse on television or their smart phones. Out in suburban Chicago, I’ll be directly teaching to astronomy classes at a couple high schools in Naperville, Ill. Both are excellent schools with robust curricula, which makes me feel optimistic about the success I’ll have there. With schools, the most difficult part of teaching about solar eclipses isn’t getting through to the students; rather, it’s getting the message through to administrators that yes, there are safe ways to view them and you don’t need to pull the classroom blinds and lock the doors to prevent students from being outdoors and being blinded by the eclipse (which seems to be the prevailing view of these school bosses). And these are people with doctorates after their names! And finally, at the NSTA’s national conference in Chicago, I’ll be spreading the word there as well, but this time to my teaching colleagues. I’m curious as the awareness level among the national cross-section of science instructors there. My greatest concern is that with the advent of new science standards and teaching responsibilities, less time will be spent on preparing students for this eclipse, and how ironic is that? Stay tuned for my follow-up report. I’m hoping that the work I’ve been putting into “eclipse awareness” will start reaping results. No one said this would be easy! Eclipse durations over the Faroe Islands. Keep in mind that finding a location in clear weather is more important then maximizing eclipse duration. On the 20th of March, the Faroe Islands is one of only two places on land that experience the total solar eclipse. The other is Svalbard. Both locations present challenges; cloudy weather, cold temperatures, and low sun altitude during eclipse. 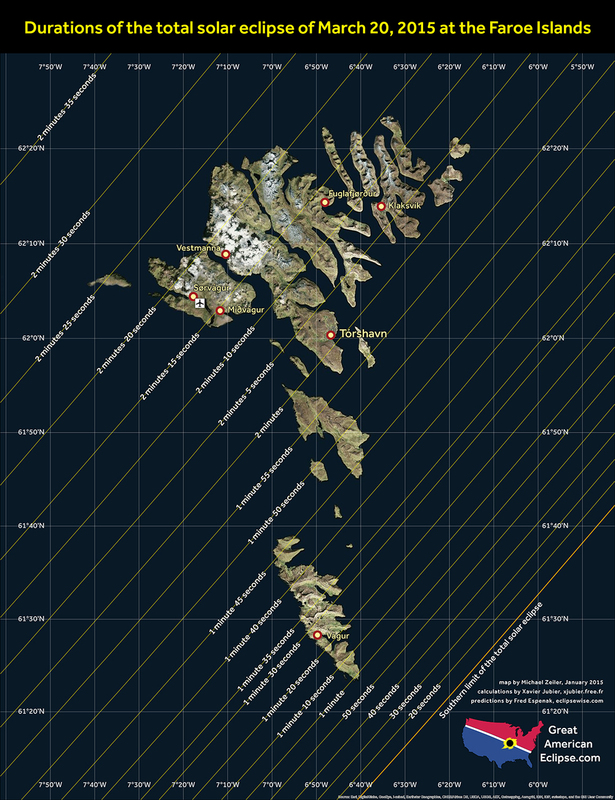 The maps below will be useful to the residents of the Faroe Islands and eclipse visitors so that they can avoid shadowed areas during the eclipse. The Faroe Islands have many mountains and the sun will only be about 19 degrees high during the total solar eclipse. Luckily, most of the settlements of the Faroe Islands will enjoy a fine view of totality given clear weather. However if scattered clouds force a quick relocation, the maps below will be useful in finding an area with good visibility of the total solar eclipse if and when the clouds clear. The maps show simulated shadows during the three moments; when the moon first bites into the sun and begins the start of the eclipse (called 1st contact), the mid-point of the total solar eclipse, and when the moon leaves the sun and ends the start of eclipse (called 4th contact). The maps showing the shadows during the total solar eclipse incorporate an adjustment to provide at least one-degree of vertical clearance above the local ridge line. I built these maps using Esri's ArcGIS software on a digital elevation model (DEM) with a resolution of 90 meters. Local authorities and media may freely share and link to these images provided a credit (in English or translation) is given to "Map by Michael Zeiler, www.greatamericaneclipse.com". I've spent many hours developing these maps for the benefit of eclipse chasers and eclipse tour operators. These maps are offered at no cost. If you would like to show your appreciation for my effort, consider a purchase from our web store, www.greatamericaneclipse.com/store/. These three maps below show detailed maps of the most populous regions of the Faroe Islands. You can click on each map and save to your computer for printing. Each map is 26 inches high and 23 inches wide, or about 66 cm by 58 cm. The three maps below show a general map spanning all the Faroe Islands. You can click on each map and save to your computer for printing. Each map is 21 inches high and 27.5 inches wide, or about 53 cm by 70 cm. On the 20th of March, a total solar eclipse crosses the North Atlantic Ocean and threads a passage between Iceland and the United Kingdom and Scandinavia. There are only two landfalls for the total solar eclipse; Svalbard and the Faroe Islands. Both locations present challenges; cloudy weather, cold temperatures, and low sun altitude during eclipse. The maps below will be very useful to visitors to the Longyearbyen area so that they can avoid shadowed areas during the eclipse. This is a mountainous area and the sun will only be about 11 degrees high during the total solar eclipse. Most of the area inside Longyearbyen, the only sizable settlement in Svalbard, will not be able to see the total solar eclipse. It is critical for residents and eclipse chasers to be able to find locations from which to see totality. The maps show simulated shadows during the three moments; when the moon first bites into the sun and begins the start of the eclipse (called 1st contact), the mid-point of the total solar eclipse, and when the moon leaves the sun and ends the start of eclipse (called 4th contact). Furthermore, four maps are given for the total solar eclipse so that eclipse observers can decide on their threshold for how close the eclipsed sun appears to the intervening ridge line. If you were to stand exactly at the shadow boundary on the map showing actual shadows, you would only see half of the eclipse because actual shadows are computed from the center of the sun. The three other maps show simulated shadows that effectively show the areas to avoid if you want 1, 2, or 3 degrees of clearance between the sun and the ridge line below. No one should choose to be at the boundary of the actual shadow because you only see half the corona. Casual eclipse observers could reasonably choose to be at the boundary of the shadows marked with 1 degree of vertical clearance, but this clearance is too close for most eclipse chasers. Eclipse landscape photographers might choose a 1 degree clearance for a dramatic effect. Most eclipse chasers will choose a location with a vertical clearance of at least two or three degrees. This clearance is desirable to see and photograph extended features of the sun's corona . 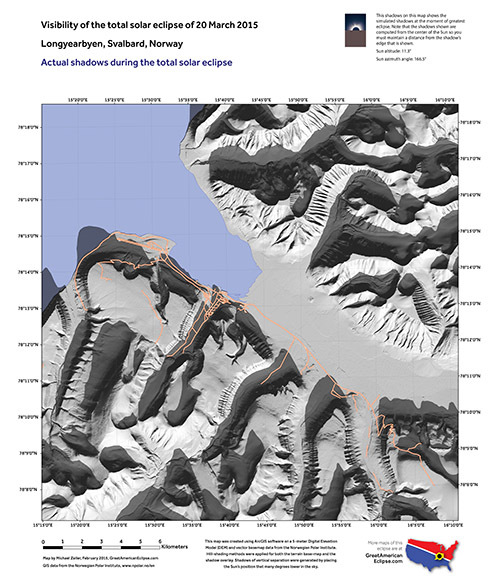 I have built these maps using Esri's ArcGIS software on a detailed digital elevation model (DEM) from the Norwegian Polar Institute. The elevation data points in the DEM have a very high resolution of 5 meters, so the derived shadows are accurate and trustworthy. Local authorities and media may freely share and link to these images provided a credit (in English or translation) is given to "Map by Michael Zeiler, www.greatamericaneclipse.com, using terrain data from the Norwegian Polar Institute". These six maps below show the extent of the region around Longyearbyen which is accessible by vehicle. You can click on each map and save to your computer for printing. Each map is 28 inches high and 24 inches wide, or about 71 cm by 61 cm. These six maps show the area in and around the settlement of Longyearbyen. Note that there is only one spot within Longyearbyen which has a good clearance view of totality. You can click on each map and save it to your computer for printing. Each map is 28 inches high and 24 inches wide, or about 71 cm by 61 cm. No doubt you've seen the stunning images and videos of the night sky processed by top astrophotographers. These are always popular on social media and for good reason; they depict our view of outer space from our beautiful home planet. The beauty of our night sky is an unfamiliar sight for many city dwellers, but once you get away from the city lights, you will see an amazing edge-on view of our galaxy plus planets, stars, nebulae, galaxies, comets and more. These images amaze us because they place us within the context of our astonishing universe and frame the view of the heavens from our remarkable planet, Earth. Did you know that you can produce these types of images yourself with little more than a decent DSLR camera, tripod, and image processing software? You don't even need a telescope, just a bit of knowledge and some practice. It is easier than you may think to create images like this yourself. And now you have the perfect mentor to guide you step-by-step. My friend Alan Dyer has just produced a remarkable eBook entitled "How to photograph and process nightscapes and timelapses". This eBook can be downloaded on most Apple devices including the iPhone,iPad, and the MacBook through the iBook store. This book is aimed at both aspiring and experienced nightscape photographers and contains encyclopedic coverage of all aspects of this subject. You'll find dozens of embedded videos and image galleries organized through 400 pages and 18 chapters. There are chapters on selecting cameras and accessories, operating your camera, processing still images, time-lapses with effects such as tilt and pan and dolly motion, trouble shooting, and video processing. There is also a section on photographing lunar and solar eclipses with solid advice for capturing these phenomena. I've just spent several pleasurable and illuminating hours looking through this ebook. I was impressed by the depth of content, the clarity of explanation, the utility of this book for both novices and experts, clear and engaging writing, and high publication quality. Alan also employed an advanced digital publishing platform to achieve a high level of interactivity. He says he spent a year and a half building this book and the result attests to that. Alan Dyer is one of today's leading nightscape photographers and this book will guide you through the secrets of composing remarkable nightscape imagery and advanced time-lapse videos. This book will certainly spawn a new generation of nightscape photographers and time-lapse artists. Get this book, digest Alan's wisdom, practice and develop your chops, and you'll be well positioned to capture amazing images and videos of the Great American Eclipse of August 21, 2017. Last week, I was privileged to attend the launch of the Orion capsule atop a Delta IV Heavy rocket. I was selected by the NASA Social program which invites persons influential in social media to help communicate NASA's mission and activities to the public. I joined about 130 of my peers and we received amazing access to NASA facilities and personnel. There is a NASA Social event for every significant launch and if you have a social media presence, you can apply for future events. Follow @NASASocial on Twitter to keep informed of upcoming events. The community of launch watchers has similarities to the community of eclipse chasers. Both events are a peak moment in your life and remarkable phenomena, one natural and one man-made. One difference: launches have frequent delays, but eclipses do not! It's worth traveling far to see both. This was an exhilarating event and surpassed my expectations. I was astonished that we were admitted to such important and historic facilities that no public tour will ever visit. It was truly an amazing experience and I highly recommend the NASA Social program to anyone fortunate to be selected. NASA's message is clear: This EFT-1 (experimental flight test) mission is the first step in the journey to Mars. The excitement of the NASA managers and astronauts we met was palpable. This is the beginning of mankind's venture into deep space beyond the Moon. This architecture comprising the Orion capsule and the SLS (Space Launch System) rocket will be the foundation of our first forays into the rest of the solar system. Commercial space ventures such as SpaceX and Boeing will take over the job of ferrying astronauts and supplies to the ISS (International Space Station) and NASA will move on to doing the big things as it did in the glory days of Apollo. My friend xavier jubier had media credentials for the orion launch and captured great close-up photographs of the launch. click on the image to see his web page. Some cynics may note that the Orion capsule and SLS rocket bear a resemblance to the Apollo capsule and Saturn V rocket. We learned that the designs are outwardly similar because the laws of physics have not changed in the past half-century but that they are completely different inside. For example, the Orion capsule is rated to carry four astronauts for 21 days and this mission can be extended by attaching to a habitat module. We also learned about the preliminary goals for the next unmanned launch of Orion on top of the first SLS rocket and the following manned launch. An idea on the table is that this first manned launch may visit a small captured asteroid brought by an automated space mission to the orbit of the Moon. All these activities are focused on the penultimate goal of reaching Mars, perhaps in the 2030's. - We first met in an auditorium across the street from the VAB (Vehicle Assembly Building). We were introduced to the program and had an opportunity for each of us to make a brief statement of who we were. - We then boarded buses and visited a location near the Orion launch pad. We had a photo opportunity and met the director of the United Launch Alliance, the builders of the Delta IV Heavy rocket. - Next, we travelled to the Neil Armstrong Operations and Checkout Building. This was a highlight of our tour as we received rare access to the large clean room in which both the Apollo and Orion capsules were built. We saw the assembly platforms, vacuum chambers, high-pressure room, and the first hardware being assembled for the next Orion launch. Because of the sensitive technology that we saw, we were not allowed to take photographs inside. But we did see and photograph a striking sight just inside the entrance; the original suit worn by Neil Armstrong on the Moon! - Our last stop on the bus was the building where the segments of the solid rocket boosters of the SLS rocket are being processed. To control the costs being borne by the American taxpayer, NASA is re-using booster segments flown on the Space Shuttle program for SLS. - We then engaged in a two-hour television conference back in the auditorium. We met NASA Administrator Charles Bolden and several astronauts and program managers. After that, we drove ourselves to the visitor center of the Kennedy Space Center for another talk and the opportunity to see the shuttle Atlantis on display. - The next morning, we were bussed to our viewing location for the launch. This was on the causeway with a clear view of the launch pad from about three miles away. Because of a confluence of factors - a stray boat, wind gusts, and sticky valves on the rocket - the launch was aborted for that day. Afterwards, we visited the VAB and saw the crawler from the Shuttle era being refurbished to carry the larger SLS rocket. Regrettably, I could not stay for the next day when the launch was successful. But I consoled myself with the idea that I would return with my wife to see the first launch of Orion on SLS. Before I left New York to attend the Solar Eclipse Conference in New Mexico (see posting below), I distributed solar shades (courtesy of Elaine Lewis at NASA) to many of my students who were interested in watching the small partial event that would be visible from the East Coast on October 23rd. While the weather was perfect for us in the southwest, it was unfortunately cloudy and rainy for most back home, but a few fortunate students did catch glimpses of the small notch in the Sun as it set in the west. Luckily, I had mailed several shades to my family members in other parts of the country, and they were able to see the eclipse as well. Luckily I was traveling with a couple dozen shades as well, so I began giving them out to people I met along my trip—pilots, flight attendants, baggage attendants, rent-a-car employees, my seatmates on the plane. All of them were excited to receive them and if we were outdoors, they immediately began to use them. A couple of sharp-eyed ones saw the huge sunspot grouping that was front and center on the Sun that week—in fact, that was my first time seeing naked-eye sunspots myself. I left my email address with some of the people I gave glasses to, so they could write back with their views of the eclipse that Thursday. To my delight, I received several emails, all telling me what a wonderful view they had and how thankful I gave them the shades. This warmed my educator’s heart, and also gave me hope that people WILL get pumped up for the big one in 2017. Based on the excitement level of the emails and of those I watched in person using the glasses, I’m now certain that even people who won’t be in the path of totality will still have a rewarding and exciting view of the partial stages. The photo here was taken in Patagonia at the 2010 total solar eclipse, during the partial stage. You can clearly see the fat crescent of the Sun viewed through my friend’s eclipse glasses. I remember telling those around me to make certain they removed their shades as totality hit. I’ve heard stories of people leaving them on during totality and missing it completely, and I didn’t want that to happen there! Even those of us in Sunspot, New Mexico watching the eclipse with our scopes and binoculars still found time to glance up using the inexpensive shades. I guess it was the thrill of seeing that amazing sunspot group without magnification, or maybe just the fun of seeing an eclipse using our own eyes, without any optical help. I hope this is the case at every solar eclipse to come, where millions of people, young and old, with nothing more than their solar glasses, will simply go outside and look up, and enjoy the spectacle taking place above them. This shows the beginning of the 10 foot map infographic of the great american eclipse. Click on the image to open the 10 foot map in a new browser window. Once it appears as a long and thin map, click again within the map to enlarge as you see above. You can then scroll through this map from the Pacific to the Atlantic. I'm pleased to release a very long map infographic focusing on the path of totality for the August 21, 2017 total solar eclipse. This map is designed so that it will fill your browser window and you can scroll across the entirety of the path. If you were to print this map on paper, it would be 8 inches tall by 10 feet 8 inches! The reason the map is so narrow is that it focuses on the zone where we are trying to encourage all of the American public to get to; the path of totality. Plus a length of over 10 feet allowed me to communicate a great deal of detailed information about the eclipse path. One of the first things you'll notice are the oval figures for the shadow of the Moon. These figures are drawn at three-minute intervals and the local times, a short description of the area, and the speed of the Moon's shadow upon the American landscape are shown. You'll also see curves annotated with durations. At the southern and northern limits of the of the path, you would also see the eclipse for a split second. As you move deeper into the eclipse path, your duration of totality with increase. This map gives you a sense of the zone where you want to be on eclipse day. Above the path of totality are a couple of dozen topics that will give you some instant knowledge about the key aspects of the eclipse; strategies for successful viewing, comments on climate, background on eclipse history and science, and coming eclipses. • Only solar eclipses in which Brno (a city in the present-day Czech Republic) lies within the region of partial eclipse (penumbra) appear in the Elementa Eclipsium. • Figures of the eclipse’s appearance during maximum eclipse are given for the perspective of Brno. •Eclipse timings are given for Brno. From October 23 through 26, 137 people from 19 countries gathered to talk about solar eclipses this past weekend. The historic Cloudcroft Lodge was the perfect location. Topics included totals, partials, annulars, education & outreach, photography, viewing techniques, data collection, the 2017 Great American Eclipse, maps and further geekitude. Each presentation was unique and interesting. I learned a lot in a short period of time, and sold lots of eclipse items to our fellow solar eclipse enthusiasts. We saw a partial eclipse of the sun from the Sacramento Peak National Solar Observatory, which was truly spectacular. Thanks to Mark Margolis and Rainbow Symphony for the eclipse glasses. The large sunspots on the partially eclipsed surface of the sun made for beautiful and inspiring photos. We also visited the NM Museum of Space History in Alamogordo at sunset, which was enjoyed by all. Thanks to Travelquest for the nice evening reception at the museum. Excitement is now building for the next total eclipse which will take some to the Faroe Islands and Svalbard, Norway! The arctic circle is not too far or too cold for this intrepid group. Documentary film producer Nelson Quan will be following Geoff Sims to Svalbard, hoping to successfully capture the eclipse for the film. We are all looking forward to seeing the finished documentary to be titled Chasing Shadows. There were three eclipses in 2014 which were visible from Australia, each offering a unique opportunity to obtain time lapse sequences. First up, in mid-April, there was a total lunar eclipse. As viewed from the east coast of Australia, the Moon would rise in total eclipse during twilight. This provided the chance to photograph the red Moon in the dusk sky, and while the landscape was still illuminated. My home city of Sydney was looking cloudy, so a short flight north was in order. I photographed the eclipse from Broken Head (near Byron Bay) which is near the NSW/QLD border. Clouds prevented me from capturing the exact moment of Moonrise, however there were enough breaks which allowed some interesting sequences to be obtained. Surprisingly, there were a lot of people out and about on the beach to watch the event, as seen in the wide angle video. A mere two weeks later an annular solar eclipse occurred in Antarctica. As far as we know, no human being observed the annular phase (since logistically it would have required "wintering over" at the French/Italian Concordia station at Dome C). Thankfully, the partial phases of this eclipse were widely visible across Australia. Once again, the weather forecast was looking dodgy around Sydney, but an international flight the next day prevented me from escaping too far. I made the decision to photograph the eclipse from a lookout near Glenbrook, at the base of the Blue Mountains. This was more a decision for a scenic location rather than weather-wise, but I lucked out again because Sydney was mostly clouded out. The money shot this time was going to be a real time video of the partially eclipsed Sun sinking below the horizon; but alas - it was not to be. I was covered in clouds shortly after first contact. On the flip side, at least I saw something, and the clouds made for a brilliant sunset! The final eclipse of 2014 (for Australia) was another total lunar eclipse. This time, from eastern Australia, the Moon would be much higher in the sky, and would require a different photographic approach. For the third time this year, Sydney had a terrible forecast for the eclipse, so after checking a number of numerical weather models, I made a dash about 3 hours west, to the Capertee lookout near Lithgow. I had perfectly clear skies, at an amazingly beautiful location. As well as the "standard" wide angle and telephoto sequences, I busted out my old film camera (an Olympus OM-1) and took a 3 hour exposure of the entire lunar eclipse. It was fun to use film again after such a long hiatus! I hope you enjoy the compilation video of these three events, which also includes some behind the scenes footage of yours truly in action! This October 23, a partial solar eclipse will be visible from nearly all of North America and the easternmost part of Siberia. By inspecting this map, you can get a very good idea of what you will see on the afternoon of October 23rd. The red curves show the eclipse magnitude, the maximum fraction of the Sun's diameter occulted by the Moon. If your magnitude is 0.50, then half the Sun's diameter is covered. The yellow-black figures show a view of the partial solar eclipse at maximum partial eclipse where you are at. A map like this can tell us a lot about where optimum viewing locations are, given good weather on eclipse day of course. If I could choose to be anywhere within the United States on eclipse day, I would want to be in far northwestern Michigan on the shore of Lake Michigan, near the orange linen that says 'Partial solar eclipse at maximum during sunset'. The lake will give a photogenic view of the setting sun with an eclipse magnitude of 0.60. Plus, a bonus of reflections in the lake. But anywhere in the region from Michigan down to the Alabama and Georgia will offer a nice sunset view. Just be certain to be in a high location with an excellent western horizon. I expect to see the best eclipse photographs on October 23rd from this area. Even if you are not an experienced astrophotographer, try your hand at this and use a long lens on your DSLR. While I won't be along this line, I will be in a special location on eclipse day. I will be attending the Solar Eclipse Conference 2014 at the National Solar Observatory at Sacramento Peak, New Mexico. The foremost eclipse experts will be gathered there and a chief topic will be the Great American Eclipse of 2017.